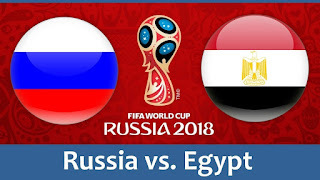 After an imperious display from the tournament hosts, Russia, in defeating Saudi Arabia 5-0, all eyes are set on what should be another fantastic game against African side Egypt. The second round of fixtures for Group A begin tomorrow as Russia sit top with 3 points in contrast to Egypt yet to win any. Another win could see Russia almost guaranteed a place in the round of 16 whereas Egypt will be all but out. The stakes could not be higher, which is why Mohamed Salah should definitely start for the Pharaohs. Russia took on what can only be described as an incredibly underwhelming Saudi Arabian side. Goals from Yuri Gazinskiy, Denis Cheryshev, Artem Dzyuba and Alexsandr Golovin secured an emphatic win. The hosts started with the experienced Akinfeev in goal, Figueira Fernandes, Kutepov, Ignashevich and Zhirkov made up the Russian defence, In midfield, Gazinskiy, Zobnin, Samedov, Dzagoev and Golovin started with Smolov up front. Egypt's narrow 1-0 defeat to Uruguay, thanks to a dramatic late goal from Jose Giménez, has piled all the pressure onto the African side in what can only be described as a must-win game. On the positive side, Mohamed Salah is likely to begin in the Egyptian team that is chasing three points. Against Uruguay, El-Shenawy started in goal, with Fathy, Gabr, Hegazi and Shafy in defence. For the Egyptians, their midfield comprised of Elneny, Hamed, Warda, El Said and Trézéguet while Mohsen started upfront. Egypt have it all to do and with Senegal becoming the first African nation of this World Cup to score from open play and win a match, this may serve as a source of inspiration for the Egyptians. However, it will be difficult as Russia will certainly have home advantage and a spring in their steps following their confident performance against Saudi Arabia. If Mohamed Salah starts, he could definitely find himself on the scoresheet so 2-1 to Egypt.